Bakers® Joint Delicious – helps to support your dog’s joint mobility the delicious way! 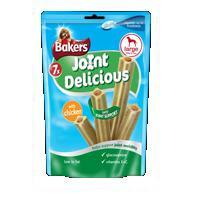 Bakers Joint Delicious - a delicious soft chewy stick fortified with Bakers Joint Complex Tasty Joint Support! With just one chew a day, you can help support your dog’s joint mobility the tasty way!